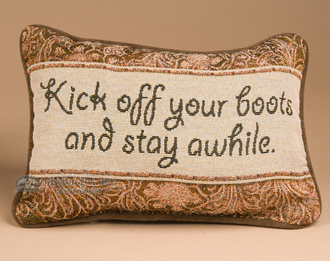 Word pillows are perfect accents for southwest style and western home decorating. Ranging from horse sense to the wolf and the wise old owl, word advice pillows are fun and humorous. Add a word pillow as a conversation piece to any chair, couch or bed. Their whimsical charm will bring a smile to the faces that see them. Made with soft decorator fabrics, word pillows are just right for a variety of uses and will definitely make an impact on your guests.